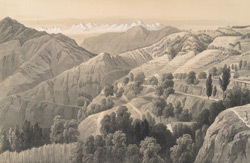 This lithograph is taken from plate 13 of 'Views in the Himalayas' by Mrs WLL Scott. In 1850 Scott sketched this view at sunset at the staging bungalow in Kotargh. She wrote that the mission here was run by a German sent by the Chuch Missionary Society. There had been initial mutterings about him "taking his hire when his labours were so unfruitful, but he has lately had such good cause to be satisfied and thankful, that he has requested of the Society a fellow-labourer to assist him." The river Sutlej runs between the hills in the two nearest ranges. In the early 20th century, an American missionary imported apple seeds to Kotgarh and today Himachal Pradesh is a renowned apple-growing region of India, with Kotgarh at the heart of its orchards.